Jack’s world is 11 feet square, and growing smaller every day. When he was four, he could race the shape of a C from one wall, around the bed, to the other wall, in 18 steps, but now that he’s five he can do it in only 16 steps! The small room has never felt confining to Jack like it does to Ma; he’s always had new things to learn, and he doesn’t get tired of reading the same books every day like Ma does. But as he grows older, his curiosity keeps pace. What is that black thing that fell on Skylight? Ma says it’s a leaf, fallen from a tree; Jack had thought trees were TV, not real. And why does the air smell different when the big metal Door beeps and Old Nick comes into the room at night? Ma says it smells like cut grass in the summer, and she says one day they will open Door themselves to see the real grass, though Jack finds the idea of leaving Room even harder to believe than the existence of trees and grass. Jack absorbs the things Ma begins to tell him slowly. His world had seemed absolute and unchanging; Jack and Ma are the only residents of Room, and the only real people in Jack’s world. They don’t count Old Nick, who only comes to Room at night to see Ma; Jack’s not sure he’s real, anyway, since Ma won’t let him get close. It’s difficult to say any more without spoiling the suspense. But I probably don’t need to–the story will quickly envelop you and you will become intensely invested in Jack’s and Ma’s story. I loved this book. It is by far the best book I’ve read all year. A few years ago, I took a class on fairy tales and developed a keen fascination with myths, folk tales, and legends. I was particularly interested in reimagined tales; Anne Sexton and Margaret Atwood thrilled me with their modern retellings of classic stories. For my final paper, I chose to contrast two versions of “The Little Mermaid”: Disney’s animated film, and a short story, “The Tale of the Voice,” by an unknown (to me) Irish author, Emma Donoghue. Fast forward to a few weeks ago, when Donoghue was short-listed for the Man Booker Prize. 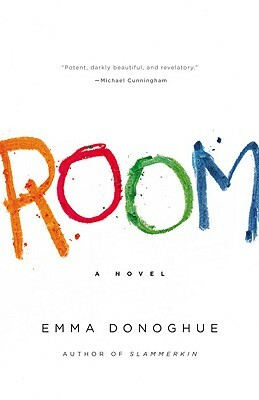 The literary world was abuzz, suddenly, with one word: Room. I knew I had to read it from all of the glowing recommendations it was getting, but when I discovered that this Donoghue was the same feminist storyteller I’d so admired as an undergrad, I couldn’t get my hands on it fast enough. But even if I hadn’t heard anything about the book, I still would’ve devoured it as quickly as I did—it took less than two days. Don’t even try to read this book before bed—not because it is so scary, but because you will be up half the night thinking about Jack and Ma until you give up and spend the other half finishing their story. The book is original, thrilling, captivating, and heartwrenching. At the same time, it is unexpectedly fresh and optimistic, filled with life and hope and wonder. The normal traits of a five-year-old child—curiosity, restlessness, friendliness—are all amplified by Jack’s isolation. But so is the bond between him and his mother. Despite Ma’s frustrations at the limitations to raising Jack—the constant need to ration clothes and food, make sure he gets enough exercise in the tiny space, and stay sane in the face of the child’s unending energy and curiosity—the love that she and Jack share shows the incomparable connection between parent and child, and attests to the power of such a bond to make even the worst situation bearable. A few reviews that I read complained that the book would have been better if we could experience more from Ma’s point of view. I disagree wholly. If the story were through Ma’s eyes, it would have been far too disturbing. But seeing her story through Jack’s loving and playful point of view mitigates the pain and desperation of her situation. I was pleased, too, to see that Donoghue seamlessly weaves elements of classic fairy tales into the story—aside from references to Jack and the Beanstalk, she also gives me another reworking of “The Little Mermaid”! By incorporating elements common to fairy tales—such as the relationship between parent and child; themes of imprisonment; ogres (such as Old Nick); and the wonder of an unknown world—Donoghue has written a story that is at once haunting and uplifting, fresh yet familiar. This is the kind of book you race through, bursting with the characters’ contagious anguish and passion, but when you reach the end you instantly regret your haste. But then you have the pleasure of flipping back through the pages and relishing once again Donoghue’s masterful storytelling ability. Loved your review. I’ve read and reviewed this book, and also read a lot of reviews of it, but yours brought something fresh and new to the discussion, and made me think differently about the book. Well done! Thanks, Gayle! That’s the best compliment a book reviewer can receive!! I liked Room too! The child narrator was essential, although I’m not sure he would actually be as cheerful/well adjusted as Jack was. But, I suppose it was neccesary to keep the story from being too oppressive.